Assassin's Creed is a 2016 Franco-American film action film based on the video game franchise of the same name. The film is directed by Justin Kurzel, written by Michael Lesslie, Adam Cooper and Bill Collage, and stars Michael Fassbender (who also produced), Marion Cotillard, Jeremy Irons, Brendan Gleeson, Charlotte Rampling and Michael K. Williams. The film is set in the same universe as the video games but features an original story that expands the series' mythology, taking place during the Spanish Inquisition. Filming began in late August 2015 and concluded in January 2016. Assassin's Creed was released on December 21, 2016, in the United States and France. It received negative reviews from critics, though some cited it as of higher quality than most videogame film adaptations. It grossed over $240 million worldwide against its $125 million budget. In 1492 Andalusia, during the Granada War, Aguilar de Nerha is accepted into the Assassins Brotherhood. He is assigned to protect Prince Ahmed de Granada from the Knights Templar. In 1986, adolescent Callum "Cal" Lynch finds his mother killed by his father, Joseph, a modern-day Assassin. Gunmen led by Alan Rikkin, CEO of the Templars' Abstergo Foundation, arrive to capture Joseph, who convinces his son to escape. In 2016, Cal is sentenced to death for murdering a pimp, but his execution is faked by the Abstergo Foundation, which then takes him to their research facility in Madrid. He is told that the Templars are searching for the Apple of Eden, in order to eliminate violence by using the Apple's code to control humanity's free will. Sofia, Alan's daughter and the head scientist, reveals that Cal is a descendant of Aguilar, the last person confirmed to be in possession of the Apple. She puts Cal in the Animus, a machine which allows him to relive (and the scientists to observe) Aguilar's genetic memories, so that Abstergo can learn what he did with the Apple. In 15th-century Spain, Aguilar and his partner, Maria, are deployed to rescue Ahmed, who has been kidnapped by the Templar Grand Master Tomas de Torquemada, to coerce Ahmed's father, Sultan Muhammad XII, to surrender the Apple. Aguilar and Maria intercept the Templars, but are overpowered and captured by Torquemada's enforcer, Ojeda. Cal is quickly pulled out of the Animus by Sofia. Cal encounters other Assassin descendants held captive at the facility, most of whom are suspicious of his motives, with the exception of Moussa, the descendant of an 18th-century Haitian Assassin named Baptiste and a key leader. Cal begins experiencing hallucinations, dubbed "the Bleeding Effect", of both Aguilar and Joseph. Cal and Sofia build a rapport during their sessions; she confides that her mother was likewise murdered by an Assassin, sharing his hatred of the Brotherhood of which his father is a member. Back in the Animus, Aguilar and Maria are scheduled for execution but he manages to free them, leading to a rooftop chase in which they escape through an Assassin "Leap of Faith". Cal's mind reacts violently to the session and he is temporarily paralyzed. When Cal learns that his father is also at the facility, he confronts Joseph over his mother's death. Joseph informs him that the Bleeding Effect will allow modern Cal to possess Aguilar's combat abilities. He also learns that his mother was an Assassin, and she chose to die by Joseph's hand rather than be forced into the Animus. Unconvinced, Cal vows to destroy the Assassins by finding the Apple. Meanwhile, Alan is pressured by a Templar Elder, Ellen Kaye, to shut down the multibillion-dollar Animus Project because they have already "won ... people no longer care about their civil liberties ... they're content to follow", leading Sofia to question her father's true intentions. Reaffirmed by his encounter with his father, Cal willingly enters the Animus once again, whereupon Aguilar and Maria ambush a meeting between Muhammad and Torquemada. They succeed in killing the Templars and retrieving the Apple, though Ojeda captures Maria in order to force Aguilar to surrender it. Instead, Maria chooses death, and stabs herself on Ojeda's blade. Aguilar kills him and escapes through another Leap, the force of which causes the Animus to violently malfunction. Aguilar gives the Apple to Christopher Columbus, who promises to take it to his grave. When Moussa and the modern Assassin prisoners start a riot in order to escape, Alan orders the facility purged. Abstergo security kills Joseph and most of the other prisoners. Cal stands in the Animus chamber and is met with the projections of a number of his Assassin ancestors, including Aguilar, Arno Dorian, Joseph and his mother, while Sofia glimpses the projection of an Assassin identical in appearance to her. Persuaded by his mother, Cal embraces his Assassins' Creed and, having fully assimilated Aguilar's memories and abilities, joins Moussa and two other surviving Assassins in escaping the facility. Having retrieved the Apple from Columbus' burial vault, Alan and his followers converge at a ceremony in a Templar sanctuary in London to celebrate their triumph. Inside the sanctuary, a disillusioned Sofia meets with Cal, who has come to take the Apple, and she reluctantly allows him to act. Cal retrieves the Apple, but kills Alan to do it. While Sofia vows revenge against Cal, the Assassins depart, vowing to once again protect the Apple from the Templars. An original character created for the film, Lynch is a descendant of the Assassins, with genetic links to Aguilar, an Assassin in 15th century Spain. Cal has been running his whole life, ever since he was forced to witness his mother's murder as a child. But living on society's fringes has also kept him shrouded from the secrets of his ancestry. Awaiting execution on death row, Cal is captured and brought to the Abstergo facility (Abstergo Foundation in Madrid, Spain), where he may soon come to understand his place in the world, and control the power burning inside of him. Fassbender described Cal by saying "He doesn't have a lineage he can feel a belonging to ... he's a bit of a lost soul. He's always been drifting in and out of correctional facilities," and conversely described Aguilar as "very much somebody that belongs to the Creed. He has a cause, he's sort of been following that cause. He belongs to it." Angus Brown as young Cal. The CEO of Abstergo Industries and, particularly, his private Madrid-based organization Abstergo Foundation dedicated to the "perfection" of humankind, one of the leaders of modern-day Knights Templar, and the father of Sofia, to which he feels a strong love. He is determined to achieve his orders' centuries-long goal to gain control over humanity. Through Cal, and the ancestral memories he holds, Rikkin may finally have found the key to achieving ultimate power for the betterment of humanity. "I'm a mover and a shaker. A shadowy figure. A man who is very much at the forefront of this world," Irons says. Like Sofia, Rikkin believes in "removing the violent impulse all men carry," and sees an opportunity in Cal. "Rikkin believes the cause of unhappiness in the world is war, and if he can get rid of that then people like him will be safer and wealthier. He's not a very moral man, but he thinks he is." The character previously appeared in the first Assassin's Creed game. The father of Cal Lynch and an Assassin, who was forced to kill his wife, Mary Lynch, in order to save her from Abstergo's invasion. Brian Gleeson, Brendan's real-life son, portrays a young Joseph. Charlotte Rampling as Ellen Kaye: Referred to as "Your Excellency", is a senior member of the Templar Elders. Looking to re-purpose Abstergo's multibillion-dollar annual budget used for the Animus program. A descendant of Baptiste, a Haitian Assassin who uses voodoo poison against his enemies. Escapes with Cal and Lin to London. Williams said, "Moussa definitely has some assassin skills. Although I think he prefers to use trickery and magic and voodoo to slay his opponents as opposed to just hand-to-hand combat, but if it needed to be he could take it to the mat." Baptiste previously appeared in Assassin's Creed: Liberation. Denis Ménochet as McGowen: Head of Rikkin's large Abstergo security force. An assassin in 15th century Spain and the closest ally of Aguilar. More measured than her partner-in-arms, Maria is light on her feet and exceedingly quick, and together they are an unstoppable force. Like Aguilar, she understands the damage the Templar influence is doing to her country. Khalid Abdalla as Sultan Muhammad XII. Essie Davis as Cal's mother. Matias Varela as Emir: A descendant of Yusuf Tazim, a Middle Eastern Assassin who uses a bow and arrow, along with a sword and knives, against his enemies. Callum Turner as Nathan: A descendant of Duncan Walpole, an Assassin turncoat from the 18th century. Tomas de Torquemada ruled over the Spanish Inquisition for 15 years, directing his inquisitors to root out and murder those he deemed to be manipulating the faith in their own pursuit of power. The most potent tool in his arsenal was the auto-da-fé: theatrical acts of public penance in which all those who crossed the Inquisition were burned alive. While Torquemada pulls the strings, Ojeda does the real work, exacting brutal punishment on any who dare to challenge the Inquisition. He thinks nothing of razing entire towns and commands a great army; however, his lack of subtlety is his weakness, because it allows the Assassins who operate in the shadows to keep their eyes on him at all times. Michelle H. Lin as Lin: A descendant of Shao Jun, a Chinese Assassin from the 16th century. You know, we absolutely want to respect the game. There's so much cool stuff in the game that we're actually spoiled for choice in terms of what we can use and what we can't, but we also want to bring new elements to it and perhaps our own version of things that already exist in the game. But we're definitely making a feature film, and we're approaching it as a feature film, as opposed to approaching it as a video game. But I love the world ... When I met up with the guys from Ubisoft and they started to explain this whole world and the idea of D.N.A memory – you know, I think it's a very feasible scientific theory. I just thought, 'This is so rich,' and about the possibility of it being this cinematic experience. So I'm really excited about it, and we're working very hard to make sure that we've got the best and most exciting, original package. —Michael Fassbender, star and producer of the film, on how much of the film would remain faithful to the game and how much would be an original story. 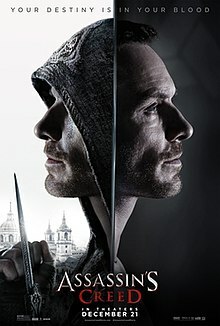 By October 2011, Sony Pictures was in final negotiations with Ubisoft Motion Pictures to make a film version of Assassin's Creed, to be released in 3D. In July 2012, Michael Fassbender was announced to star in the film, as well as co-produce, through his DMC Film banner, with Conor McCaughan. Jean-Julien Baronnet, CEO of Ubisoft Motion Pictures, said Fassbender was the studio's first choice to star in the film. As well, negotiations between Sony Pictures and Ubisoft Motion Pictures were put on hold, with Ubisoft executives planning to develop the film independently in order to maintain greater creative control. Sony was able to still distribute the film, but Ubisoft Motion Pictures would not resume talks until packaging the project with a writer and director. In October 2012, Ubisoft revealed the film would be co-produced with New Regency and distributed by 20th Century Fox. New Regency financed part of the film's production, in order for Ubisoft to not shoulder much financial risk, yet still be able to be involved creatively; RatPac Entertainment and Alpha Pictures also co-financed the film. Baronnet also revealed Ubisoft hoped to release the film along with a new game launch for the series. In January 2013, Michael Lesslie was hired to write the film. In June 2013, Frank Marshall entered negotiations to produce the film, along with Fassbender and McCaughan, for DMC Film, and Eli Richbourg for Ubisoft. In July, Scott Frank revealed he was rewriting the script. In January 2014, a Linkedin profile for executive producer Fannie Pailloux stated filming was scheduled to begin in August 2014. In April 2014, Adam Cooper and Bill Collage were hired to rewrite the script. By the end of April, Justin Kurzel was in talks to direct. In June, Olivia Munn expressed interest in appearing in the film. On February 12, 2015, Ubisoft's CEO Yves Guillemot confirmed that New Regency had begun production on the film. The following day, Marion Cotillard was revealed to have joined the cast. Filming was expected to begin in late 2015. In April 2015, Fassbender revealed that filming was scheduled to begin in September 2015. In May 2015, Alicia Vikander was in talks to star in the film, though in the following month, she took a role in the fifth Bourne film, Jason Bourne, instead, and Ariane Labed was cast in her place. Producers on the film include Baronnet, Patrick Crowley, Fassbender, Marshall, Conor McCaughan, and Arnon Milchan. In July 2015, Michael K. Williams was added to the cast. In late August 2015, Fassbender's role was revealed as Callum Lynch in the present day and Aguilar in 15th century Spain; filming locations for the film were also announced. Principal photography on the film began on August 31, 2015, with filming taking place in Malta, London, Spain, and the 007 Stage at Pinewood Studios. Adam Arkapaw serves as cinematographer, while Andy Nicholson was production designer. In October 2015, Jeremy Irons and Brendan Gleeson joined the cast. In December 2015, shooting took place in Spain, and Irons' role was revealed to be Alan Rikkin. Principal filming ended on January 15, 2016, with further filming taking place in Ely Cathedral in July. In May 2016, it was announced that Jed Kurzel, the brother of director Justin Kurzel, would score the film. Aymar Azaïzia, head of Assassin's Creed content at Ubisoft, stated that the film, which is "a brand new story, [with] new characters set in our universe," had the possibility to feature "some familiar faces," and that the present day element would feature Abstergo. Fassbender said, "We really want to respect the game[s] and the elements to it. But we also wanted to come up with our own thing. And one thing I've sort of learned from doing the franchises like X-Men is that audiences, I think, want to be surprised and to see new elements of what they already know, and different takes on it." The Animus, the machine used to experience ancestors' memories, was redesigned for the film, from a chair, to a machine that lifts the user in the air, allowing for a more modern, interactive and dramatic experience. Fassbender also noted the change was made to avoid comparisons to The Matrix. The Abstergo compound in the film features an artifact room that holds specific weapons from the games beyond the traditional Assassin wrist blades, including: Altaïr Ibn-La'Ahad's sword (Assassin's Creed); Connor/Ratonhnhaké:ton's bow (Assassin's Creed III); Edward Kenway's flintlock pistols (Assassin's Creed IV: Black Flag); the cane sword of the twins Jacob and Evie Frye (Assassin's Creed Syndicate) and the axe and guillotine gun of Arno Dorian (Assassin's Creed Unity). Fassbender also stated that Ubisoft was "very keen" about elements being created for the film, and were considering incorporating them into future games. The film also features the games' signature "Leap of Faith" jump, performed by Fassbender's stunt double, Damien Walters, rather than a digital double, as the production team wanted to make many of the elements in the film as "real" as possible, without the use of visual effects. The 125-foot (38 m) freefall was described as "one of the highest freefalls performed by a stuntman in almost 35 years". Assassin's Creed was released on December 21, 2016. The film was originally announced in May 2013 to be released on May 22, 2015, a date that was pushed back the following month to June 26, 2015. In November 2013, the film was pushed back once again to a new release date of August 7, 2015. In September 2014, the film was pushed to an unspecified 2016 release date, which was later revealed to be December 21, 2016. The film was released in 2D, 3D and selected IMAX 3D territories. Assassin's Creed grossed $54.6 million in the United States and Canada and $186.3 million in other territories for a worldwide total of $240.9 million, against a production budget of $125 million. The Hollywood Reporter estimated the film lost the studio $75–100 million, when factoring together all expenses and revenues. In North America, Assassin's Creed opened alongside Sing and Passengers, and was initially expected to gross $25–35 million from 2,902 theaters over its first six days of release. However, after grossing $1.4 million from Tuesday night previews and $4.6 million on its first day, six-day projections were lowered to $22 million. It went on to gross $10.3 million in its opening weekend (a six-day total of $22.5 million), finishing 5th at the box office. It fell 15% in its second weekend to $8.7 million, finishing in eighth, and over 50% in its third week, grossing $4.2 million and finishing 10th. On Rotten Tomatoes, Assassin's Creed has an approval rating of 18% based on 199 reviews, and an average rating of 4/10. The website's critical consensus reads, "Assassin's Creed is arguably better made (and certainly better cast) than most video game adaptations; unfortunately, the CGI-fueled end result is still a joylessly overplotted slog." On Metacritic, the film has a score of 36 out of 100 based on 38 critics, indicating "generally unfavorable reviews". Audiences polled by CinemaScore gave the film an average grade of "B+" on an A+ to F scale. Peter Bradshaw of The Guardian wrote, "I bet playing the game is much more exciting. But then getting Fassbender to slap a coat of Dulux on the wall of his hi-tech prison cell and monitoring the progressive moisture-loss would be more exciting." Robbie Collin of the Daily Telegraph was equally scathing, saying, "For everyone who thought Dan Brown's conspiracy novels were just lacking a spot of parkour, Assassin's Creed might be your favourite film of the year. But for the clinically sane 99.9 percent of the rest of us, it's rather less exciting." David Ehrlich of IndieWire gave the film a B−, and said "declaring this to be the best video game movie ever made is the kind of backhanded compliment that sounds like hyperbole, but the description fits the bill on both counts." Assassin's Creed was released onto Blu-ray and DVD on March 21, 2017  and Digital HD from Amazon Video and iTunes on March 10, 2017. In March 2016, Daphne Yang, CEO of the film's Taiwanese co-financier CatchPlay, stated that New Regency was looking to turn the film into a franchise, since it is based on "successful Ubisoft games and would make ideal sequels." Two additional films are planned, with the first sequel having entered development during the production of the initial film. Kurzel told Premiere that he would like to explore the Cold War in the sequel. ^ a b c d e Windsor, Harry (December 19, 2016). "'Assassin's Creed': Film Review". The Hollywood Reporter. Retrieved March 19, 2019. ^ "Assassin's Creed [2D] (12A)". British Board of Film Classification. December 19, 2016. Retrieved December 19, 2016. ^ "Assassin's Creed (2016). Movie Details". The Numbers. Nash Information Services, LLC. Retrieved January 12, 2017. ^ "'Assassin's Creed". allocine.fr. Retrieved April 22, 2019. ^ "'Assassin's Creed". allmovie.com. Retrieved April 22, 2019. ^ Grierson, Tim (December 19, 2016). "'Assassin's Creed': Review". Screen Daily. Retrieved May 7, 2017. ^ Blain, Louise (September 21, 2016). "The Assassin's Creed movie's historical sequences are all in Spanish". GamesRadar+. Retrieved March 31, 2017. ^ a b McClintock, Pamela. "Christmas Box-Office Crush: 'Sing,' 'Passengers,' 'Assassin's Creed' to Battle 'Rogue One'". The Hollywood Reporter. Retrieved December 20, 2016. ^ a b c d "Assassin's Creed (2016)". Box Office Mojo. IMDb. Retrieved March 30, 2017. ^ Robinson, Will (December 20, 2016). "Assassin's Creed reviews: Michael Fassbender's movie panned". Entertainment Weekly. Retrieved March 31, 2017. But early reviews are in, and despite the film's star power, critics are so far unimpressed. ^ a b Ehrlich, David (December 19, 2016). "Review: Assassin's Creed Is The Best Video Game Movie Ever Made". IndieWire. Penske Business Media. Retrieved April 6, 2017. ^ a b c d e f g h i j k l m n o p q r "Assassin's Creed DNA". Family Tree DNA. Retrieved October 29, 2016. ^ a b Wigler, Josh (July 9, 2012). "Michael Fassbender To Star In 'Assassin's Creed'". MTV News. MTV. Retrieved August 10, 2014. ^ a b c Doty, Meriah. "'Assassin's Creed' First Look: Here's Michael Fassbender as Brand New Character (Exclusive)". Yahoo! Movies. Retrieved January 28, 2017. ^ a b c d e f g Perry, Spencer (May 11, 2016). "ComingSoon.net Visits the Set of Assassin's Creed!". ComingSoon.net. Retrieved July 5, 2016. ^ a b Fleming, Mike Jr. (February 13, 2015). "Marion Cotillard To Star With Michael Fassbender In 'Assassin's Creed' For New Regency & Ubisoft". Deadline Hollywood. Retrieved February 13, 2015. ^ a b c d Busch, Anita (October 1, 2015). "Jeremy Irons & Brendan Gleeson Join 'Assassin's Creed'". Deadline Hollywood. Retrieved October 2, 2015. ^ a b c Skrebels, Joe (May 10, 2016). "NEW ASSASSIN'S CREED MOVIE PHOTOS EMERGE". IGN. Retrieved May 10, 2016. ^ a b Jordan, Farley. "Under the Hood". Total Film (Summer 2016). ^ a b c Farley, Jordan (November 2016). "A History of Violence". Total Film (November 2016): 66. ^ a b Dornbush, Jonathon (December 22, 2015). "Hear from Jeremy Irons as Abstergo Industries' CEO in new Assassin's Creed tease". Entertainment Weekly. Retrieved December 24, 2015. ^ Sullivan, Kevin P. (August 12, 2016). "Assassin's Creed movie to feature characters from video game series — exclusive". Entertainment Weekly. Retrieved September 2, 2016. ^ Reparaz, Mikel (October 20, 2016). "ASSASSIN'S CREED MOVIE – WHAT YOU MIGHT HAVE MISSED IN TRAILER 2". Ubiblog. Retrieved October 28, 2016. ^ a b Kroll, Justin (July 6, 2015). "Michael K. Williams Lands Key Roles in 'Assassin's Creed,' 'Ghostbusters' (EXCLUSIVE)". variety.com. Retrieved July 7, 2015. ^ Casey, Dan (May 13, 2016). "12 THINGS WE LEARNED ON THE ASSASSIN'S CREED SET". Nerdist. Retrieved July 5, 2016. ^ a b c d Jaafar, Ali (June 24, 2015). "Ariane Labed Joins Cast of 'Assassin's Creed' Opposite Michael Fassbender". Deadline Hollywood. Retrieved June 25, 2015. ^ Cornet, Roth (August 8, 2014). "Michael Fassbender Wants To Honor The Game & Bring In Original Elements On The Assassin's Creed Movie". IGN. Retrieved August 10, 2014. ^ Graser, Marc (October 20, 2011). "Sony breeds 'Creed'". Variety. Retrieved August 10, 2014. ^ Keslassy, Elsa; Hopewell, John (May 15, 2011). "Gallic vidgamer Ubisoft lines up 3 features". Variety. Retrieved August 10, 2014. ^ Graser, Marc; Keslassy, Elsa (July 9, 2012). "Fassbender game for 'Assassin's Creed'". Variety. Retrieved August 10, 2014. ^ a b Graser, Marc (October 22, 2012). "New Regency, Fox partner on Ubisoft's 'Assassin's Creed'". Variety. Retrieved August 10, 2014. ^ Siegel, Tatiana (January 14, 2013). "New Regency and Ubisoft Tap Brit Writer for 'Assassin's Creed' Film (Exclusive)". The Hollywood Reporter. Retrieved August 10, 2014. ^ Kit, Borys (June 11, 2013). "Frank Marshall to Produce 'Assassin's Creed' (Exclusive)". The Hollywood Reporter. Retrieved August 10, 2014. ^ Vejvoda, Jim (August 16, 2013). "Scott Frank Rewriting Assassin's Creed Movie". IGN. Retrieved August 16, 2013. ^ Mahardy, Mike (January 25, 2014). "Assassin's Creed Movie To Begin Shooting In August, Exec Says". IGN. Retrieved January 25, 2014. ^ Fleming, Mike Jr. (April 7, 2014). "'Exodus' Scribes Adam Cooper & Bill Collage Take 'Assassin's Creed'". Deadline Hollywood. Retrieved April 7, 2014. ^ Fleming, Mike Jr. (April 29, 2014). "Michael Fassbender Poised To Re-Team With 'Macbeth' Helmer On 'Assassin's Creed'". Deadline Hollywood. Retrieved April 29, 2014. ^ Olivia Munn Wants to be in Assassin's Creed Movie. IGN. June 26, 2014. Retrieved June 26, 2014. ^ Tach, Dave (February 12, 2015). "Assassin's Creed movie is in production and has a confirmed 2016 release date". Polygon. Retrieved February 13, 2015. ^ Douglas, Edward (April 30, 2015). "Exclusive: Michael Fassbender on Developing Assassin's Creed". ComingSoon.net. Retrieved May 1, 2015. ^ Fleming, Mike Jr.; Jaafar, Ali (May 22, 2015). "Hot Cannes 'Circle' Package Imperiled As Alicia Vikander In Talks To Star In 'Assassin's Creed', New 'Bourne' Film". Deadline Hollywood. Retrieved May 22, 2015. ^ "Big screen adaptation of Assassin's Creed starts shooting in Malta". TimesofMalta.com. September 3, 2015. Retrieved September 4, 2015. ^ Lee, Chris (December 9, 2015). "Michael Fassbender was playing the hero in Assassin's Creed when he nabbed a SAG Award nomination". Entertainment Weekly. Retrieved December 10, 2015. ^ a b Chitwood, Adam (May 11, 2016). "'Assassin's Creed': 35 Things to Know about the Ambitious Video Game Adaptation". Collider. Retrieved July 5, 2016. ^ Schaefer, Sandy (September 11, 2015). "Assassin's Creed Movie Has Started Filming In Malta". Screen Rant. Retrieved September 11, 2015. ^ Jayson, Jay (December 13, 2015). "First Look At Michael Fassbender On The Set Of Assassin's Creed". Comicbook.com. Retrieved December 15, 2015. ^ Jayson, Jay (January 15, 2016). "Assassin's Creed Movie Starring Michael Fassbender Wraps Filming". Comicbook.com. Retrieved March 31, 2017. ^ Cliss, Sarah (July 27, 2016). "Hollywood comes to Ely as cathedral closes for filming of Assassin's Creed movie starring Michael Fassbender and Marion Cotillard - News". Wisbech Standard. Retrieved March 31, 2017. ^ "Jed Kurzel to Score 'Assassin's Creed' Film Adaptation". Film Music Reporter. May 1, 2016. Retrieved August 16, 2016. ^ Osborn, Alex (August 28, 2015). "ASSASSIN'S CREED MOVIE FEATURES SHARED UNIVERSE WITH GAMES". IGN. Retrieved August 28, 2015. ^ Shaw-Williams, H. (May 11, 2016). "Assassin's Creed: Michael Fassbender Explains Animus Redesign". Screen Rant. Retrieved August 24, 2016. ^ Blain, Louise (March 21, 2017). "The Assassin's Creed movie's deleted scenes reveal the game Assassins we never got to see". GamesRadar. Future plc. Retrieved February 27, 2018. ^ Shaw-Williams, Hannah (May 20, 2016). "Assassin's Creed Movie May Feature More Assassins From the Games". ScreenRant. Retrieved February 27, 2018. ^ Loughrey, Clarisse (August 16, 2016). "Assassin's Creed: Watch stuntman make 125 feet 'Leap of Faith'". The Independent. Retrieved August 16, 2016. ^ a b Phillips, Tom (January 6, 2015). "Assassin's Creed film now due Christmas 2016". Eurogamer. Retrieved January 6, 2015. ^ Vejvoda, Jim (May 17, 2013). "Assassin's Creed Movie Slated for 2015 Release". IGN. Retrieved May 18, 2013. ^ Nicholson, Matt (June 21, 2013). "Fox Shuffles X-Men, Apes and Assassin's Creed". IGN. Retrieved June 21, 2013. ^ Collura, Scott (November 12, 2013). "Fantastic Four Reboot, The Secret Service Release Date Changes". IGN. Retrieved November 12, 2013. ^ McClintock, Pamela (September 18, 2014). "'X-Men' Spin-Off 'Deadpool' Gets Winter 2016 Release Date". The Hollywood Reporter. Retrieved September 18, 2014. ^ D'Alessandro, Anthony (December 13, 2016). "'Rogue One' Will Reign At Christmas Box Office; Do Other Movies Have A Shot?". Deadline Hollywood. Retrieved March 31, 2017. ^ McClintock, Pamela (December 21, 2016). "Box Office: 'Rogue One,' 'Sing' Win Wednesday; 'Assassin's Creed' Beats 'Passengers'". The Hollywood Reporter. Retrieved March 31, 2017. ^ Busch, Anita (December 27, 2016). "'Fences,' 'La La Land' Enter Top 10 In Rogue One', 'Sing' Holiday B.O." Deadline Hollywood. Retrieved March 31, 2017. ^ "'Rogue One' Doesn't Want To Fall To 'Hidden Figures' As Winter Storm Helena Closes Theaters". Deadline Hollywood. Retrieved July 11, 2018. ^ "Assassin's Creed (2016)". Rotten Tomatoes. Fandango. Retrieved July 3, 2018. ^ "Assassin's Creed Reviews". Metacritic. CBS Interactive. Retrieved December 22, 2016. ^ Bradshaw, Peter. "Assassin's Creed review – Michael Fassbender game movie achieves transcendental boredom". The Guardian. Guardian News and Media. Retrieved December 29, 2016. ^ Collin, Robbie. "Assassin's Creed, review: Even Michael Fassbender can't make this junk leap off the screen". The Daily Telegraph. Telegraph Media Group. Retrieved December 29, 2016. ^ Blu-ray.com. "Assassin's Creed Blu-ray". Retrieved September 28, 2017. ^ Frater, Patrick (March 22, 2016). "'Assassin's Creed,' 'Splinter Cell' Being Eyed for Sequels". Variety. Retrieved March 22, 2016. ^ Schwartz, Terri (May 14, 2016). "ASSASSIN'S CREED MOVIE CREATORS WANT TO PROVE TO FANS THEY UNDERSTAND THE GAME". IGN. Retrieved May 15, 2016. ^ "Exclu - le film Assassin's Creed 2 pourrait se dérouler pendant la Guerre froide". Première (in French). Retrieved July 29, 2017.